Today Perennially Puzzled Bob Tisdale is puzzled about ocean heat. Going by what he's written today (archived here), he knows less about ocean heat transport than I do. And I know very little about the subject. This article isn't anything more than a bit of a hodge podge of material relating to ocean heat transport. It's prompted by Perennially Puzzled Bob's article. I'm aware that a lot of HotWhopper readers know a lot more about the subject than me, so feel free to point out errors or add to the discussion. If Manmade Greenhouse Gases Are Responsible for the Warming of the Global Oceans……then why do the vertical mean temperature anomalies (NODC 0-2000 meter data) of the Pacific Ocean as a whole and of the North Atlantic fail to show any warming over the past decade, a period when ARGO floats have measured subsurface temperatures, providing reasonably complete coverage of the global oceans? Let's have a look. 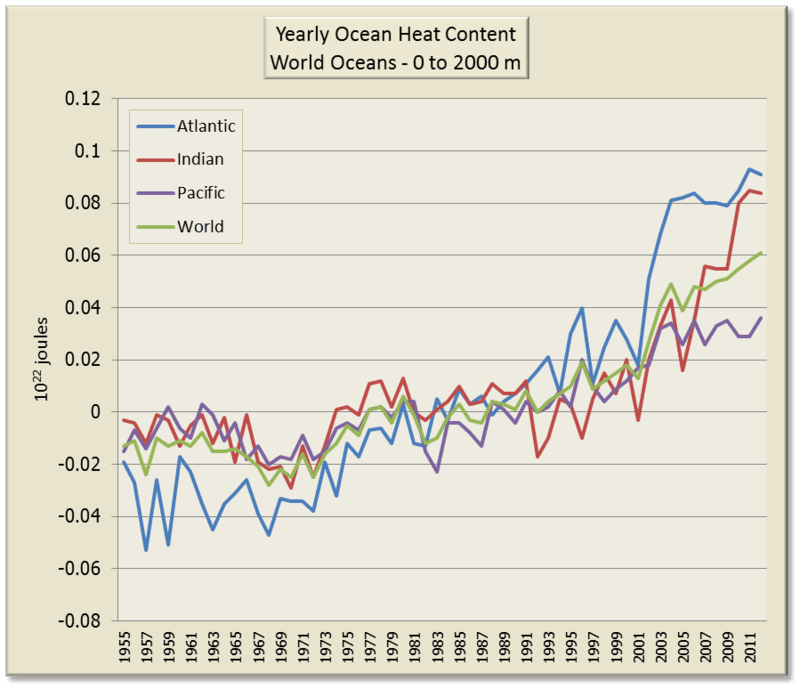 Here is the ocean heat content with data from NODC/NOAA. 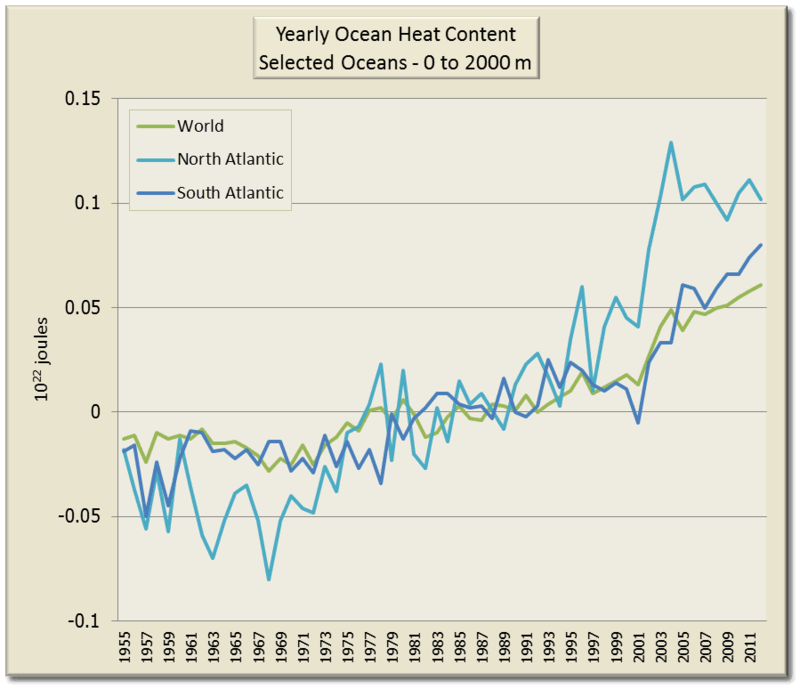 First the change in ocean heat content in the different oceans and globally. As shown above, the biggest increase in heat content in recent years in the top 2000m is in the Indian and Atlantic Oceans. Here is a chart showing the north and south Atlantic and global total. So you can see how the heat shifts around. The heat in the North Atlantic shot up around the turn of the century, then it kept going up, more so in the South Atlantic than the North. Let's move up and just look at the top 700 metres. 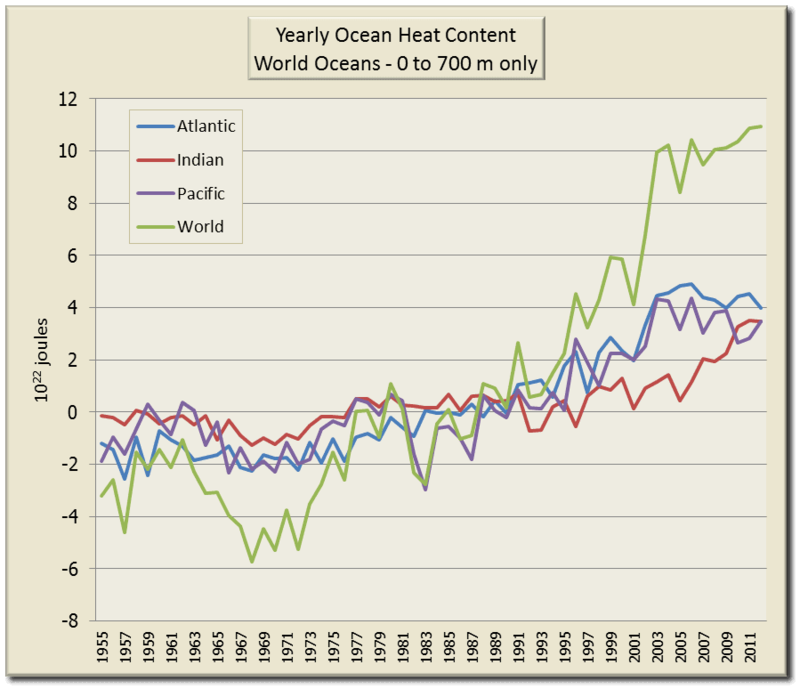 Here is a chart tracking the heat content of the different oceans. Here it appears that the top 700 m of the Indian Ocean got a lot warmer since 2000 while the heat content in this upper level of the Atlantic and Pacific didn't change much. 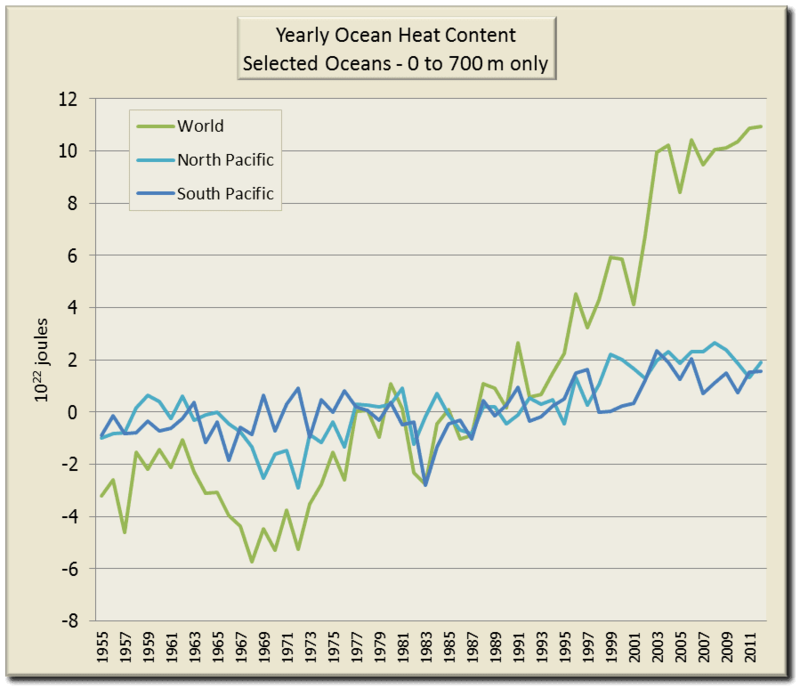 In fact in the Pacific as a whole, the heat content of the top 700 metres dropped a bit. Here is a chart of the North and South Pacific. Most of the increased heat globally in the top 700 metres is down to the Indian Ocean heating up. 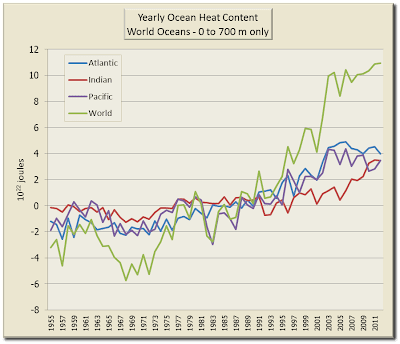 Or, in other words, why is the warming of the global oceans (0-2000 meters) over the past 10 years limited to the Indian and South Atlantic Oceans, when carbon dioxide is said to be a well-mixed greenhouse gas, meaning all ocean basins should be warming? He seems to think that CO2 being a well-mixed greenhouse gas (which it is) means that everywhere on Earth will warm at the same rate. He's wrong. Air moves, oceans move, heat is transported around the world in different ways at different times. However the oceans have a life of their own. Think how deep 700 metres is, then think just how deep 2000 metres is. That's two kilometres or, for the metrically challenged, 1.24 miles. And it's all sea water. Water isn't static. The oceans aren't static. Water moves in the oceans. 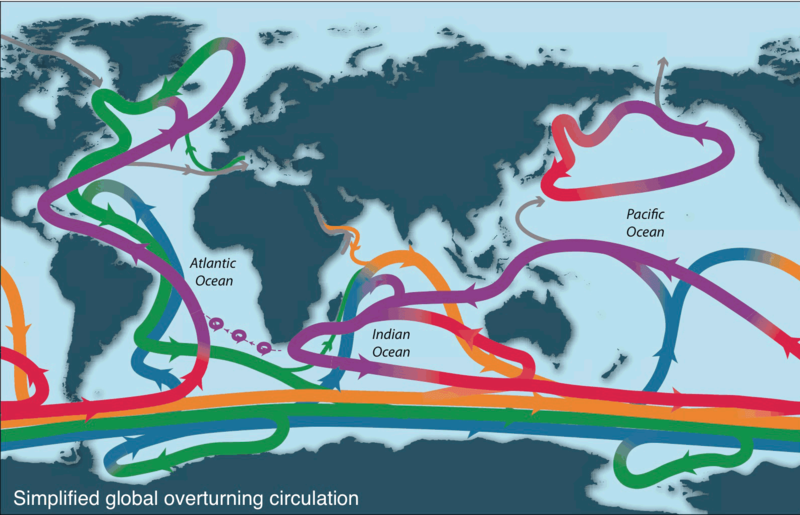 I found this chart in a paper by Lynne Talley from Scripps, which is a simplified view of the global overturning circulation. Figure 1. Schematic of the global overturning circulation (“GOC”). Purple (upper ocean and thermocline), red (denser thermocline and intermediate water), orange (IDW and PDW), green (NADW), blue (AABW), gray (Bering Strait components; Mediterranean and Red Sea inflows). Updated from Talley et al. (2011), based on Schmitz (1995), Rahmstorf (2002), and Lumpkin and Speer (2007). Source: Talley 13. That's not the whole story by a long shot. But it gives some idea of how water moves within and between the different oceans, coming up for air (so to speak) and moving to depths. The Talley paper in Oceanography gives a lot of detail and is quite technical. If you're up for that level of discussion I can recommend it. If you are new to the subject (like me) and want a simpler overview, I found a PowerPoint presentation that has some neat diagrams. It's a start. From that as I understand it, most of the heat transport between the oceans and the surface is wind-driven. At depth within the oceans it's a different story of course. 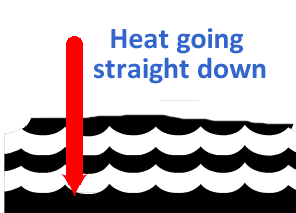 Meridional heat and freshwater transfer: The ocean and atmosphere work together to move heat and freshwater across latitudes, as required to maintain a quasi-stationary climate pattern. The wind-driven and thermohaline ocean circulation accomplish this task for the ocean, by moving warm waters poleward, colder water toward the Equator. On average the ocean meridional heat flux is higher or at least equivalent to that of the atmosphere between the equator and 30° latitude, with the atmosphere becoming dominate at higher latitudes. Ocean currents of differing salinity also move freshwater from place to place to close the global hydrological budget. For example, salty water flows away from the evaporative subtropics to be replaced with lower salinity water from the tropics. If this is more than you bargained for, you can blame Bob Tisdale for prompting me to look into the topic with his dumb question at WUWT. I'd have thought he would know better given he's often going on about water moving around when he pontificates about ENSO. The odd thing is that Bob refers to some recent papers that go a fair way to explaining the accumulation of heat within the deeper ocean. Bob says the data shows differently, but he's wrong. Maybe he didn't understand the papers or maybe he did and he's counting on the fact that a lot of his readers won't bother reading them. The picture emerging is one where the positive phase of the PDO from 1976 to 1998 enhanced the surface warming somewhat by reducing the amount of heat sequestered by the deep ocean, while the negative phase of the PDO is one where more heat gets deposited at greater depths, contributing to the overall warming of the oceans but cooling the surface somewhat. 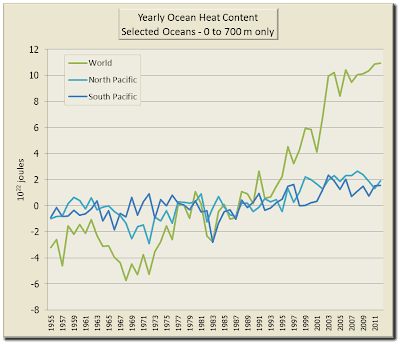 The Paciﬁc Ocean appears to account for the majority of the decadal variability [Chen et al., 2008]. Nevertheless, the events in the Paciﬁc undoubtedly also affect the Atlantic, Indian, and Southern Oceans as the system acts collectively to equilibrate to these changes in the ﬂow of energy. I note that Bob only looks at the top 2,000 metres. (The deepest part of the Pacific is the Mariana Trench which goes down almost 11 kilometres at its deepest.) I don't know how far down in the Pacific Ocean the heat referred to by Trenberth and Fasullo gets to. But there sure is a lot of water in which heat can accumulate. Just a few of the comments from the illiterati at WUWT (archived here). Any idea why the Indian and South Atlantic are warming and the rest not? Volcanic chains? Anomalies are nice but not the point. Heat is sitting in the ocean and heat is temperature just like cold and every thing in between. So warm water is heat and that cant go under cold water because of it being lighter than cold water. By giving it a fancy name it masks the problem of the case. And by doing so they cane take it a way from reality. You say that “Kevin Trenberth and associates say the recent series of La Niña events are causing the Pacific Ocean to warm at depths below 700 meters”. Looking at your derived analysis of the 700-2000m depth temperatures, it would appear you are proving Trenberth to be correct, with a cooling surface and warming ocean underlayer. Is my understanding correct? Correct me if I am wrong,from my understanding of Trenberth’s analysis, I think that the warming down to 2000m is insufficient to account for the anticipated energy imbalance, and hence it is hypothesised that the warming is also taking place at depths below 2000m? ...Sadly, blind belief in CAGW is already driving the UK down a calamitous path of high energy costs, deaths from fuel poverty and probable black-outs. To paraphrase John Maynard Keyne’s comment on stock markets, our leaders seem intent on remaining irrational for longer than the Nation will be able remain solvent. A paper of some relevance is Purkey and Johnson 2010, "Warming of Global Abyssal and Deep Southern Ocean Waters between the 1990s and 2000s: Contributions to Global Heat and Sea Level Rise Budgets". Warming below 4000 meters accounts for roughly 0.027 W/m^2 global radiative imbalance, that from 1000-4000 meters around Antarctica adds another 0.068 W/m^2. These temperature changes also account for a portion of sea level rise (abyssal warming 0.053 mm/yr, deep warming around Antarctica another 0.093 mm/yr), with both heat content and sea level rise being statistically significant. Of some interest WRT this discussion is Fig. 8, wherein warming and rise are shown basin-by-basin. The majority of the warming contribution is occurring around Antarctica, with some basins showing showing small or even negative trends. Which, given the patterns of the thermohaline circulation, is not surprising. when carbon dioxide is said to be a well-mixed greenhouse gas, meaning all ocean basins should be warming? Holy cow. I'm not so smart, but smart enough to know that this is really stoopid. Sadly, it doesn't matte that Bob Tisdale is wrong (again). He made a post that the deniers can link to. For those who can't understand the science, or don't care to try, that's all they need to dismiss ocean heating. Watts et al are in the business of constructing an alternate reality -- a counter argument -- ANY counter argument -- to the scientific ideas behind AGW. It only has to sound plausible. They are, as they say, "useful idiots." There will never be an end to them. I had a thought today. 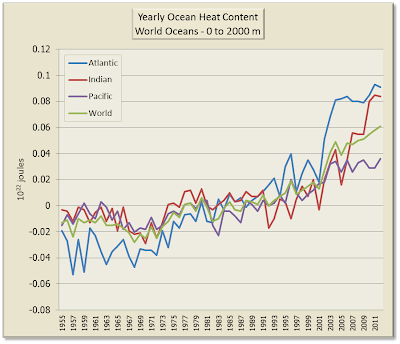 If earth's surface temperature rises fast enough in response to the increasing GHG forcing then the energy imbalance is rapidly closed reducing ocean heat intake. But on the otherhand if surface temperature rises too slow (eg PDO sinks the heat) then the energy imbalance from greenhouse gases will increase over time as GHGs rise. Wouldn't that mean ocean heat intake would increase sharply and cause an acceleration in sea level? What's the potential rate of sea level rise at a doubling of CO2 if the surface temperature is fixed? And this is amazing too! Thanks vitaminccs. Those are terrific. Sou - when the wind-driven ocean circulation intensifies, there is a strong export of near-surface water out of the Pacific Basin and into the Indian Ocean via the Indonesian Throughflow. The (observed) spin-up of the Indian Ocean gyre likewise exports heat into the Atlantic Ocean via the Agulhas Current (around the bottom end of Africa). The wind-driven ocean circulation has intensified since the early 1990's and since around 2000 (the switch to the negative (cool) phase of the Interdecadal Pacific Oscillation) has remained in a relatively vigorous state. The observations are largely consistent with physical oceanography. That Tisdale doesn't understand any of this is no great surprise. Thanks, Rob. I take it that's represented by the wide purple line going through Indonesia in the diagram above - from the Pacific to the Indian ocean. Plus the dotted line with circles going from the Indian to the Atlantic. The PDO (Pacific Decadal Oscillation) is the North Pacific pattern of sea surface temperatures associated with the change in wind-forcing, whereas the IPO (Interdecadal Pacific Oscillation) is the Pacific-wide pattern of sea surface temperatures. The IPO is more relevant as it describes the sea surface temperatures for the whole Pacific, not just the North Pacific. The wind-driven ocean circulation and the pattern of sea surface temperatures recorded in the IPO index are one and the same. When the IPO is negative (2000-to present) the gyre circulation intensifies - warming the mid-latitude ocean and cooling the tropics. When the IPO is positive (warm) the circulation is sluggish and the tropical surface ocean warms. So, based on knowledge of the wind-driven circulation these trends are likely to change when the IPO switches to its positive phase. The Pacific Basin should warm when currents which export heat out of the Pacific begin to weaken. This strengthening and weakening of the circulation over decadal timescales also leaves a distinctive spatial pattern in short-term sea level rise - the tidal gauges in Northern & Western Australia show anomalous increases when more water is pushed through the Indonesian Archipelago. So tidal gauges at specific locations also record the chnage in phase of the IPO going back in time too. Oops - my bad. I should have read your post more carefully, Rob. Shows what a novice I am when it comes to the oceans. Thanks for the explanations. One of the topics on my to do list for 2014 is to learn as much as I can about the oceans and the ocean-atmosphere interactions. I've not even touched the surface so far :) - there is so much to take in. Help! Can you please comment on Tisdales assertion that 0.6+-17 W/m^2 essentially means nothing? I'm trying to educate myself about climate, and I can't really find fault in his assertion that: "In other words, the imbalance may or may not exist." What am I missing? It sounds as if Bob is commenting on the flux at the surface. What he is missing is that it's getting hotter, therefore there is an imbalance in the system overall. If there were no radiative imbalance then Earth would not be getting hotter. The top of atmosphere flux can be measured more easily because it's just incoming minus reflected minus long wave out. At the surface there are lots of things happening and happening differently at different spots on earth - eg the ocean fluxes are different to those on ice which are different to those on vegetation which are different to those on bare earth. Altitude makes a difference too. And what happens in the atmosphere makes a difference at any time too. Eg clouds. While more spots at the surface are being measured, you can't measure every single spot all the time. Kevin Trenberth and others have been looking at the radiation budget.